The break statement in C programming language is used to terminate loop and takes control out of the loop. We sometimes want to terminate the loop immediately without checking the condition expression of loop. The break statement is used with conditional if statement. Use of break statement, change the normal sequence of execution of statements inside loop. We can use break statement inside any loop(for, while and do-while). It terminates the loop immediately and program control resumes at the next statement following the loop. 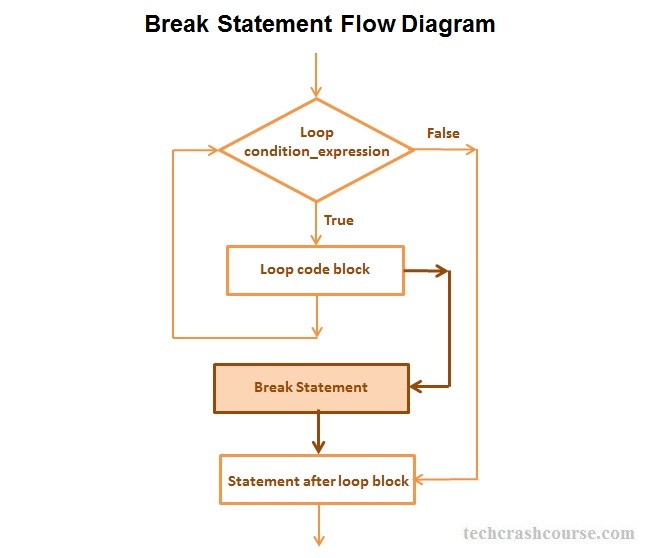 We can use break statement to terminate a case in the switch statement. If we are using break statement inside nested loop, then it will only terminate the inner loop enclosing the break statement. Above program find sum of all integers from 1 to N, using for loop. It sum is greater than 50, break statement will terminate for loop.